It’s been an exciting journey since May, when my Buzzing! 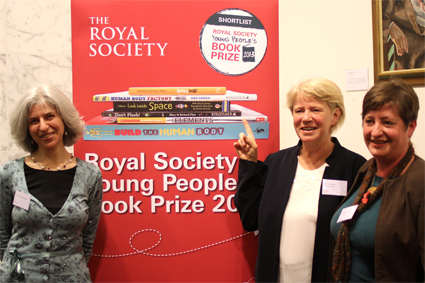 book was shortlisted for the Royal Society Young People’s Book Prize. 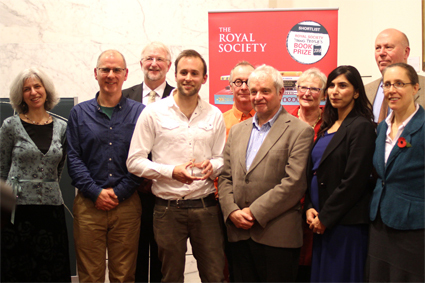 That journey reached its climax on Monday when I made my way to the Royal Society’s beautiful home in Carlton Terrace, London, for the announcement of the prize winner. There I was reunited with the book’s publisher, Nicola Loxdale of Brambleby Books, and the designer, Tanya Warren of Creatix. And the winner was …? Not me – unfortunately – but Rob Lloyd Jones for his wonderful book Look Inside Space. Congratulations, Rob! A worthy winner! 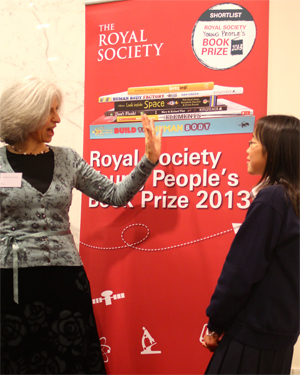 This Young People’s Book Prize has been sponsored by an anonymous donor, to whom I am very grateful. All us runner-up authors received a handsome cheque, presented to us by some of the child judges, from Ellen Wilkinson school. The highlight of my evening was when a little girl from this school came up to me after the ceremony and told me that she had liked my book best. Not only that, but her friend Yu had liked mine best too! Thank you to everyone involved in organising and judging the award. I met a whole host of fascinating people at the event on Monday, not least the very talented authors of the other shortlisted books. I commend all their books to you, and wish them all the best in their future writing endeavours.